A group of Republican senators wants Senate Majority Leader Mitch McConnell (R–Ky.) to bring a bipartisan criminal justice reform package up for a vote in 2018. Both the House and Senate are scheduled to adjourn for the year on December 14. When Congress is back in session, Democrats will control the House. According to The New York Times, the bill’s supporters are concerned that House Democrats might push for more comprehensive reforms. That would make it much more difficult for the bill to pass in the Senate, where Republicans will maintain their majority come January. The existing bill still needs to be approved in both the Senate and House before it reaches Trump’s desk. While the House’s previous version of the legislation passed overwhelmingly (360-59) in May, things are more complicated in the Senate. 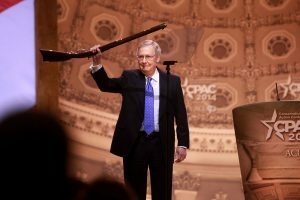 McConnell has said he wants to ensure the bill is supported by at least 60 senators before he moves it forward. But on Thursday, McConnell told Trump there probably isn’t enough time to bring the bill up for a vote before the end of the legislative session, no matter its level of support, according to the Times. Some of the majority leader’s Republican colleagues don’t think that’s good enough. Axios reported that Sens. Chuck Grassley (R–Iowa), Lindsey Graham (R–S.C. ), Mike Lee (R–Utah), and Tim Scott (R–S.C.) called McConnell yesterday “and pressured him to move forward with a vote” on the bill this year. Axios cited a Hill source with knowledge of the situation, as well as a statement from Scott’s office. “We had a good call and are hopeful that Leader McConnell will create floor time for a bill that we believe has 65 to 70 senators on board,” Scott told the outlet. We have one of the highest incarceration rate in the world so whats the fix? Turn them all lose and hope they behave themselves? Yes. Republicans want an easy task so they can avoid the wall. This is our last shot at immigration reform and they want to screw it up. Message to the GOP – Build the damn wall NOW ! !